Everyone is always so nosy when it comes to salaries and how much other people are making. This is especially true in the online marketing world, as location and experience can make all of the different. The masters of SEO are far and few, but there are still growing job markets for SEO in all area. 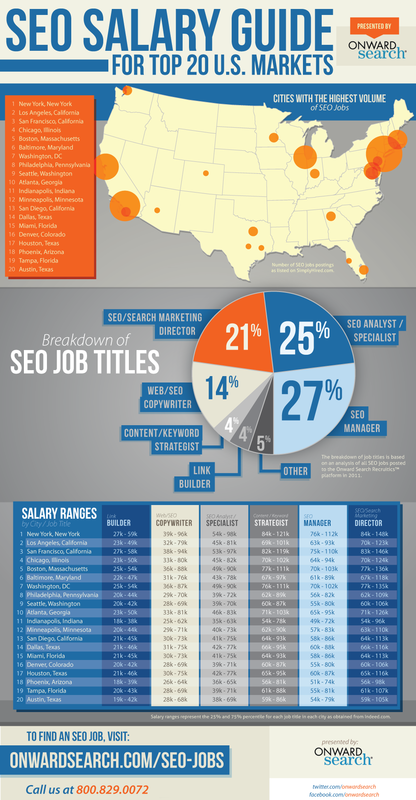 The infographic below will give you a better idea on where to find the best SEO jobs and the salaries that match. The top five locations for SEO related jobs are New York, Los Angeles, San Francisco, Chicago and Boston. Salaries and job titles in the SEO world can greatly vary. Link builders can make anywhere from $20-$50k per years, while SEO Marketing Directors can earn up into the $140k range. All salaries depend on the actual location and job title of the SEO task. Special thanks to OnwardSearch for the infographic. Share your comment 1 responseTO SEO Salary Jobs Guide.